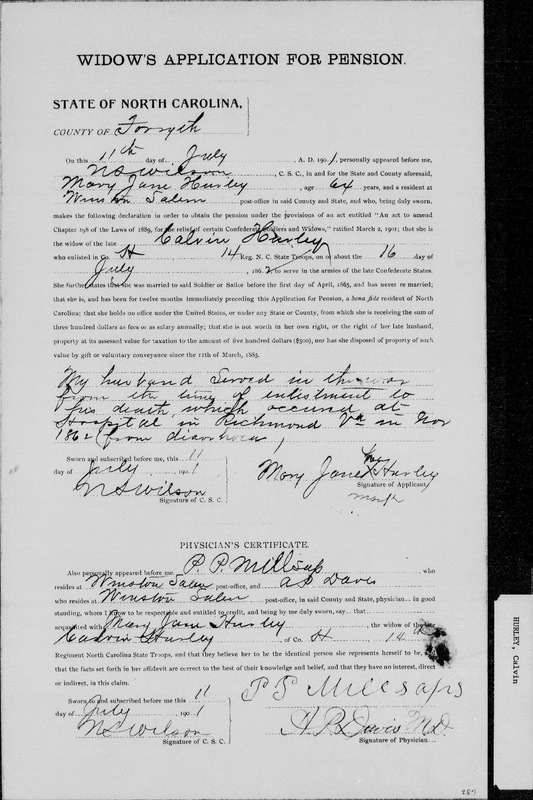 Mary Ann Hurley, widow of Calvin Hurley. 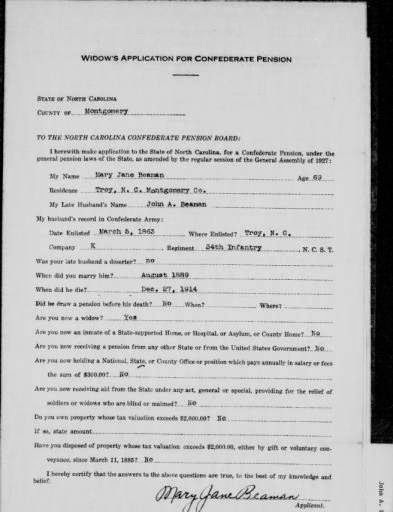 Mary Jane applied for the pension on 11 July 1901, in Winston-Salem, Forsyth County, North Carolina. At the time of the pension application, Mary Jane was living with her widowed son-in-law Hancel Beaman, and six grandchildren. Her daughter Amy Ann, died in 1897. Calvin and Mary Jane were from Montgomery County, North Carolina. He died 6 September 1862, in a hospital in Richmond, Virginia. 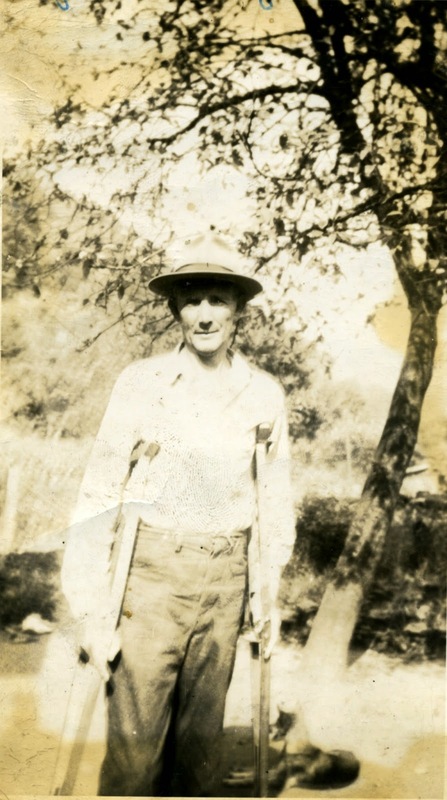 Mary Jane Beaman, widow of John A Beaman of Montgomery County, North Carolina. Although it has been a slow process I, too, have learned a few things. I always loved the family stories I heard. When I was young my grandfather, Poppy, told me about his travels across the country before he married. I especially remember him talking about the Dalton gang and an Indian princess. Of course, I wish I had asked more questions. I wish I remembered more, but I wasn’t more than five or six when he told me about them. But I’ve always wondered. Now I try to record the stories I hear. I started by writing notes about them, but I can’t tell you how many little scraps of paper I have with notes and no identifying information. Yes, even napkins! Eventually, I started carrying a spiral notebook with me whenever I am with my family or on a research trip. We spend a lot of time driving; I tried a voice recorder, but it picked up too much road noise. Then I discovered that if I turned on my video camera it recorded the conversation quite nicely. I just set it on the seat or between the seats-I don’t point it at anyone. If I’m not driving I’m also jotting notes in the current spiral notebook. They’re all so used to me doing this now no one pays attention. 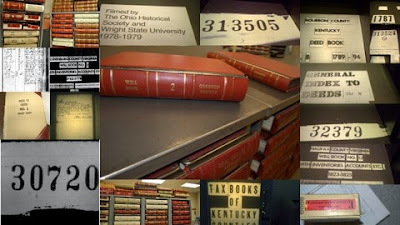 If you were to look at all the papers in my office, you can see the evolution of my genealogy research. From scraps of paper with no dates, napkins with scrawled notes, to notebooks and documents with proper citations and photos of documents including title pages and microfilm boxes. I have come a long way. I always travel with a notebook and a camera. If I can, I often make scans or copies too. (I always have a laptop, but I transfer the information to it later.) I have a great digital camera that allows me to take photos, even at 70 miles per hour. I take pictures of road signs and landmarks as we travel. It’s a photo diary, of sorts. I can look at a series of pictures and know when and where they were taken. Over the years, I developed a system that works for me. Everyone has to find their own. With all the classes, books, seminars, webinars, and online resources available to beginning genealogists they have the opportunity to do things the right way from the beginning. But, with the excitement of the chase, I imagine that they will make their share of the same mistakes. I have lost four family members this past year. Never again can I ask “when did that happen,” or “who is in that picture.” I put off the DNA tests too long, and now it’s too late. So don’t wait to read “Eleven Things I Would Do Differently,” and put those steps into practice. Don’t wait until you are rummaging in a box of papers and find an unidentified note on a napkin that you wrote years ago that will, once and for all, answer the question you didn’t know needed answering when you wrote the note on the napkin. By the way, Poppy was in Bartlesville, Oklahoma, at the same time as Emmett Dalton, after he was released from prison. I haven’t found the Indian princess. Last month we said goodbye to another family member, my uncle, Harold Ray Eastham. 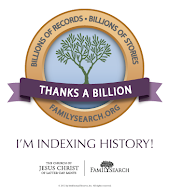 Harold was the original genealogist for our family. He had an abiding love of family and our heritage and he has passed it along. He was certainly a big influence in my life. If it weren’t for him I might not be a genealogist. He carried a black briefcase with him, full of old family photographs and copies of documents he had gathered from family members, or potential family members, far and wide. He did genealogy his own way: looking in phone books, knocking on doors, and calling everyone with the Eastham surname. He was often invited to speak at other reunions about the Eastham family. 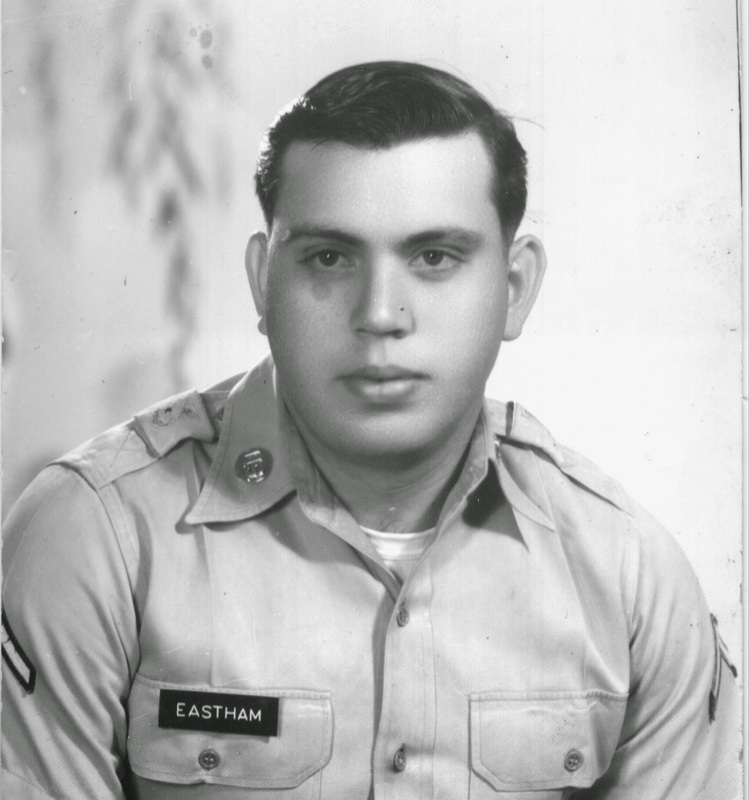 He couldn’t tell you about proper citations, or how to number your genealogy, but he knew all things Eastham. 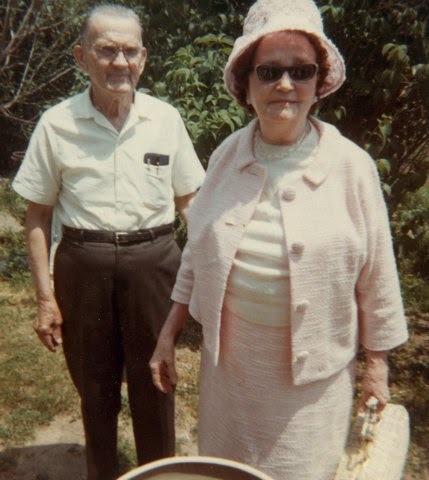 So much so that when a distant relative died, he was given the portrait of his great-grandparents, George Nathaniel Eastham and Susan Margaret Chadwick; because she knew he was the one who would cherish it. I remember the first time he took me to two old family cemeteries in Boyd County, Kentucky after a family reunion. I hadn’t spent much time in Kentucky, and I had no idea where we were. I vaguely knew of some of the occupants in the first cemetery, but not the second. After visiting the cemeteries, we went to see the remains of an old family home and I was hooked. Now I spend part of every summer roaming the hills looking for old cemeteries. I was delighted to be invited to participate in a Writers' Blog Tour by fellow blogger and ProGen friend, Liz Loveland. The purpose of the tour is to highlight writers and bring attention to their blogs. Each participant is to answer the following four questions and introduce two new writers. My post has taken some additional time to post; soon after Liz asked me to participate I had to load a moving truck and drive across the country from West Virginia to my home in Oregon. Two days later I was scheduled to speak at the Genealogical Council of Oregon Genealogy Fest in Eugene. For a little girl full of energy, with two younger siblings, Mom and Pop's house was my haven. I could, and did, run clothes through the wringer washer, take blankets and sheets outside and make huge "Arabian" tents over the clotheslines, frequently cause volcanoes to erupt in the kitchen, and play with snakes in the yard. They put up with it all, with kindness and patience. Their house had a wrap-around porch lined with pots of flowers and a swing. I liked nothing better than to set on the swing in the midst of a thunderstorm. Mom would be calling out the window, "Judi Ann, get in this house before you get struck by lightening," or some such. I still love thunderstorms.